Handheld Oscilloscope GDS-210, 2 Channel, 100MHz, 1GS/s, 1Mpts, 3.5ns Handheld Digital Oscilloscope GDS-210, 100 MHz bandwidth, 1 GSa/s real time measurment, 2 channel, 1 Mpts, memory depth with 7” 800 x 480 Full Touch Panel Capacitive LCD Multi-Point Control, Landscape and Portrait Display. Oscilloscope Probe Kit 6HP-9060, 600V, 60MHz (10:1), 18pF Oscilloscope Probe Kit 6HP-9060 with max. input voltage 600 VDC, bandwidth 60 MHz and input capacitance 18 pF at ratio 10:1. The probe has flatter response, sharper leading edges, faster rise time and replaceable cable probe head tip and ground lead. 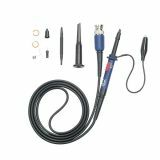 Oscilloscope Probe Kit 6HP-9100, 600V, 100MHz (10:1), 16pF Oscilloscope Probe Kit 6HP-9100 with max. input voltage 600 VDC, bandwidth 100 MHz and input capacitance 16 pF at ratio 10:1. The probe has flatter response, sharper leading edges, faster rise time and replaceable cable probe head tip and ground lead. 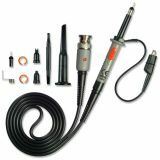 Oscilloscope Probe Kit 6HP-9150, 600V, 150MHz (10:1), 15pF Oscilloscope Probe Kit 6HP-9150 with max. input voltage 600 VDC, bandwidth 150 MHz and input capacitance 15 pF at ratio 10:1. The probe has flatter response, sharper leading edges, faster rise time and replaceable cable probe head tip and ground lead. Oscilloscope Probe GTP-150A-2, 500V, 150MHz, 13pF Oscilloscope Probe GTP-150A-2 with max. input voltage 500 V, bandwidth 150 MHz and input capacitance 13 pF at ratio 10:1. 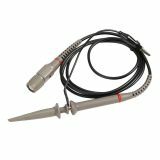 Oscilloscope Probe 600V, 35pF Probe with maximum input voltage 600 V.
List Price 23.90лв. VAT Incl. 22.70лв. VAT Incl. 21.51лв. VAT Incl. 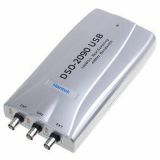 USB oscilloscope Hantek DSO 2150, 60 MHz USB oscilloscope Hantek DSO 2150, 60 MHz. 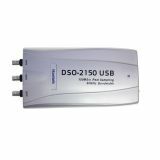 Digital Oscilloscope GDS-1152A-U, 150 MHz, 1 GSa/s real time, 2 channel Digital Oscilloscope GDS-1152A-U, 150 MHz, 1 GSa/s real time, 2 channel, 25 GSa/s equivalent time, 2Mega points record length, 5.7" TFT LCD Display. Digital Oscilloscope GDS-2074A, 70 MHz, 2 GSa/s real time, 4 channel Digital Oscilloscope GDS-2072A, 70 MHz, 2 GSa/s real time, 2 channel, 25 GSa/s equivalent time, 2Mega points record length, 8" TFT LCD Display. Digital Oscilloscope GDS-2102A, 100 MHz, 2 GSa/s real time, 2 channel Digital Oscilloscope GDS-2102A, 100 MHz, 2 GSa/s real time, 2 channel, 25 GSa/s equivalent time, 2Mega points record length, 8" TFT LCD Display. Digital Oscilloscope GDS-2104A, 100 MHz, 2 GSa/s real time, 4 channel Digital Oscilloscope GDS-2104A, 100 MHz, 2 GSa/s real time, 4 channel, 25 GSa/s equivalent time, 2Mega points record length, 8" TFT LCD Display. Digital Oscilloscope GDS-2202A, 200 MHz, 2 GSa/s real time, 2 channel Digital oscilloscope GDS-2202A, 200 MHz, sampling rate 2 GSa / s real time, 100 GSa / s equivalent, 2 channel + EXT, 8 inches TFT LCD. Digital Oscilloscope GDS-2204A, 200 MHz, 2 GSa/s real time, 4 channel Digital oscilloscope GDS-2204A, 200 MHz, sampling rate 2 GSa / s real time, 100GSa / s equivalent, 4 channel + EXT, TFT LCD 8 "display. 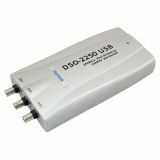 Digital Oscilloscope GDS-2302A, 300 MHz, 2 GSa/s real time, 2 channel Digital Oscilloscope GDS-2302A, 300 MHz, 2 GSa/s real time, 2 channel, 25 GSa/s equivalent time, 2Mega points record length, 8" TFT LCD Display. The oscilloscope is an instrument showing the alteration of voltage over time as well as the values ​​of this voltage. The oscilloscope is a standard instrument for examining the shape and for measuring various parameters of periodic oscillations, as well as non-periodic electrical oscillations. Through a lead-in attenuator, a synchronizing unit, horizontal and vertical amplifier and a generator of linear alternating voltage, the oscilloscope displays those signals and allows making changes of the image in accordance with the characteristics of the measured signal.